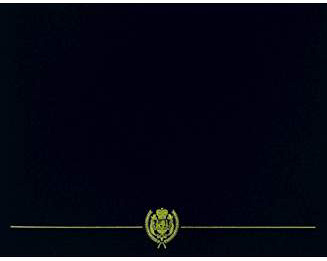 Awarded For Support Service between 24 June 1948 Through 11 May 1949. Encircled by blockading Soviet forces hoping to use starvation and other deprivations to force Allied withdrawal from Berlin, 5,000 tons of food and other necessities were required to sustain the entire population of desperate men, women and children. 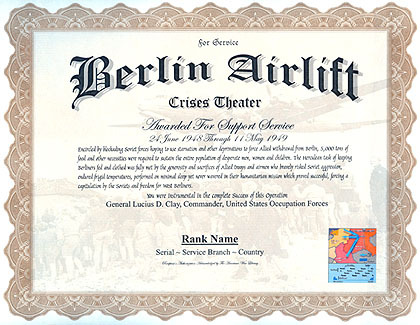 The Herculean task of keeping Berliners fed and clothed was fully met by the generosity and sacrifices of Allied troops and airmen who bravely risked Soviet aggression, endured frigid temperatures, performed on minimal sleep yet never wavered in their humanitarian mission which proved successful, forcing a capitulation by the Soviets and freedom for West Berliners. The Cold War Medal applies.